On a cold and cloudy Saturday, Stoke Rochford Golf Club’s ladies played in their annual Captain v Lady President fixture. 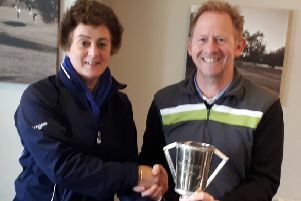 It proved a well-fought and close match, but the Lady President’s team emerged as victors, leaving lady captain Karen Rawson to be presented with the Rabbit Trophy by lady president Norma Varley. The ladies than had toasted teacakes in the clubhouse, paid for by the losing team. Karen also presented Sue Booth with a voucher for winning the Division One winter eclectic with a score of nett 58.5, and Carol Hamilton, who topped Division Two with nett 66.2.